If you hail from a non-technical background and wish to make an entry into IT sector, choosing to get trained in Salesforce can be the best way to go ahead! Salesforce is a cloud computing SaaS – Software as a Service tool, provides various software solutions and a platform for users and developers to develop and distribute custom software. Salesforce offers cloud services like Sales Cloud and Marketing Cloud which is being increasingly used for CRM solutions by thousands of MNCs and start-ups across the globe. The job scope in Salesforce is brightest in the present times and it has been estimated that this being the most popular and efficient CMR tool is going to rule the business market for many more decades to come. Salesforce is the technology that is high in demand and learning it will give you an immensely rewarding career. Entry into IT becomes fairly easy through Salesforce as unlike other technologies, it takes just few weeks to learn Salesforce with the aid of online training. Salesforce technology is fast, easy and effective. It is cloud based, so you can use it from anywhere with access to internet. Moreover, once you learn Salesforce through an online training program, it is probable that you still need guidance in your professional projects in the beginning, so for that Salesforce community offers you prompt support and guidance. Certification course in Salesforce can bring you remarkable results with excellent recruitment in reputed MNCs with a very lucrative salary package. Certified Salesforce Developers, Admins, App Builders, Analysts, Consultant are high in demand throughout all industries and sectors. Professionals who take up courses in Salesforce training are able to build or develop applications in a couple of weeks. Now after learning of all the rewarding features of Salesforce, you must very pertinently know how and where to get yourself trained in Salesforce. There are various platforms and institutes that offer online as well as on-site Salesforce training programs in cost-effective manner. 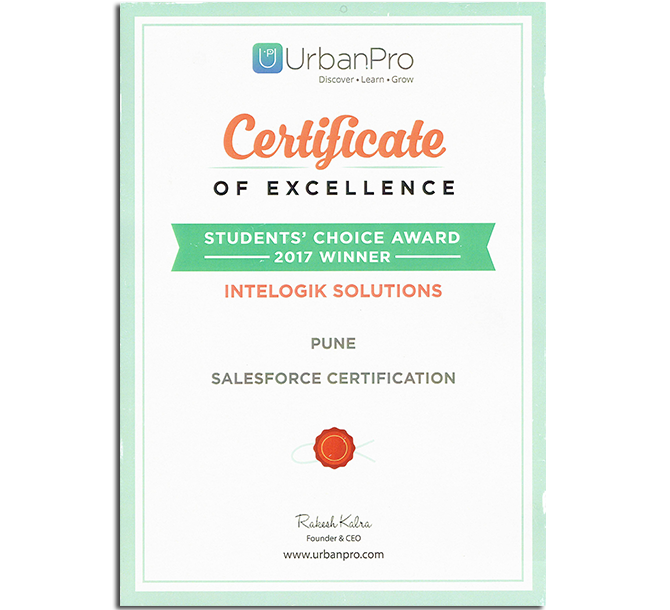 Intelogik is the top training platform and institute that offer exquisite and comprehensive training programs in different aspects of Salesforce to help you master this great tool. Online Salesforce Courses are usually the most sought-after as they can taken by candidates from anywhere and at time of their convenience. These courses can be either self-paced or instructor-led and taught by Intelogik through progressive hands-on approach. The courses are designed for self-directed training, allowing learners to begin at their convenience with structured training modules and review exercises. These reputed forums enable you to learn through videos, PPTs and real-time projects and other assignments and activities with prompt guidance and assistance from expert mentors and instructors. The courses are divided into modules and are designed in such simple patterns so as to enhance learning outcomes and give you liberties to be flexible with time and place of your choice. Moreover, these institutes make you undergo practice tests (which are in the certification exam pattern) to groom for certification exams and assist you effectively in getting a great score in the certification exam. Small batches, personal attention and 24×7 support query resolution and doubt clearance are the key USPs of Intelogik. Online Salesforce training courses are meant for different categories of learners from beginners to professionals to experts. Beginners’ course introduces learners to the concepts of CRM and the application of CRM to business operations. With limited technical and coding skills, you can fetch Salesforce-related jobs in the roles of Sales Professionals, Marketing managers, User Experience Designers, Human Resource Managers, and Content Creators. These profiles can fetch you salary packages of over $70,000 per annum. And if you are properly trained in Salesforce and even have an added advantage of a Salesforce certification, then sky is the limit for salary and professional growth. You can acquire a job in the work profiles of an Admi, Developer, Implementation Consultant, Project Manager, Platform/Technical Architect, Business Intelligence Analyst, etc. You can kickstart by getting salaries between $80,000 to $1,30,000 per annum and thereafter, the opportunities for exponential growth are unlimited.